Here’s the kicker: due to particular constraints around the architecture and revised business processes, we needed to deploy a critical mass of new architecture and business processes together in order for the solution be internally cohesive i.e. as much as we hated to go this route from a risk point of view, the first push had to be a big-bang. We did take smaller atomic subsets live earlier but there was no getting around the big-bang. Coming into the start of the year, I volunteered to handle the commissioning phase planning and execution coordination. This included the planning for the build-out of the Production host environment that would host the solution as well as the system deployment coordination leading up to the go-live. In a purer agile model we would be taking small increments of solution delivery live relatively frequently, something like the picture below. 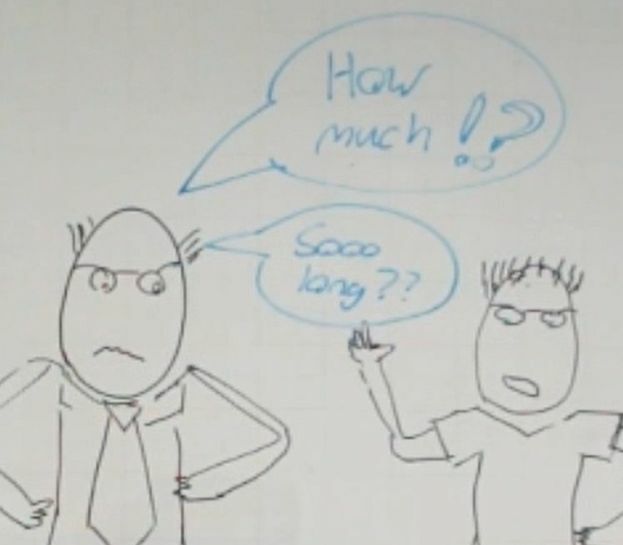 Scrum demands that you deploy all the way to operational usage at the end of each sprint. That’s relatively easy to do at a small tech start-up and more complicated at a big corporate were there are various degrees of role separation between the developers and the deployers. Yes, it is an anti-pattern and all going well, will eventually be cured by a fully automated deployment pipeline – a subject for another post. For now I’ve drawn it as a three sprint batch that is buffered as a release. The Scrum teams in the SDLC cycle had been continuously deploying to the integration testing environment (“Dev-Test”). The solution then languished here for an extended period of time because it would not be functionally cohesive until partnered with additional business processes to create an atomic whole in the new business paradigm. With such a big piece of tech needing to be commissioned and a limited deployment window (we still have over a hundred thousand customers in the pilot country so the allowed downtime was a window of a few hours), Sprint planning and post-it notes were not going to suffice as the mechanism to pull off this execution. We would not be able to transparently see the constraints: the team was too big and the tech too complicated for people to hold the dependencies in their heads. Unlike the SDLC process which is creative and iterative, we needed the deployments to be utterly predictable: the business risk was high and the short deployment window was going to be unforgiving to execution glitches. We needed to appropriately model the data migration and solution deployment sequence with full transparency of all dependencies. In order to optimize the execution time, we also needed transparency of the critical path (spending time tuning anything other than the critical path would be a waste!). …So after a long break I blew the dust off MS-Project and got stuck in, working closely with all the propeller-heads to create an execution model that satisfied the various constraints that became apparent. Once we could see the critical path we were able to check that the allowed deployment window was indeed feasible and find ways of tuning the execution from a time point of view. The final sequence including once-off data migration activities involved over a hundred atomic tasks that had to be executed across 30 or so people in a few hours (and yes, that’s after automation…). Easy to access, showed (1),(2) and (3) and provided real-time transparency of where we were in the sequence (we had teams in separate geographic locations). 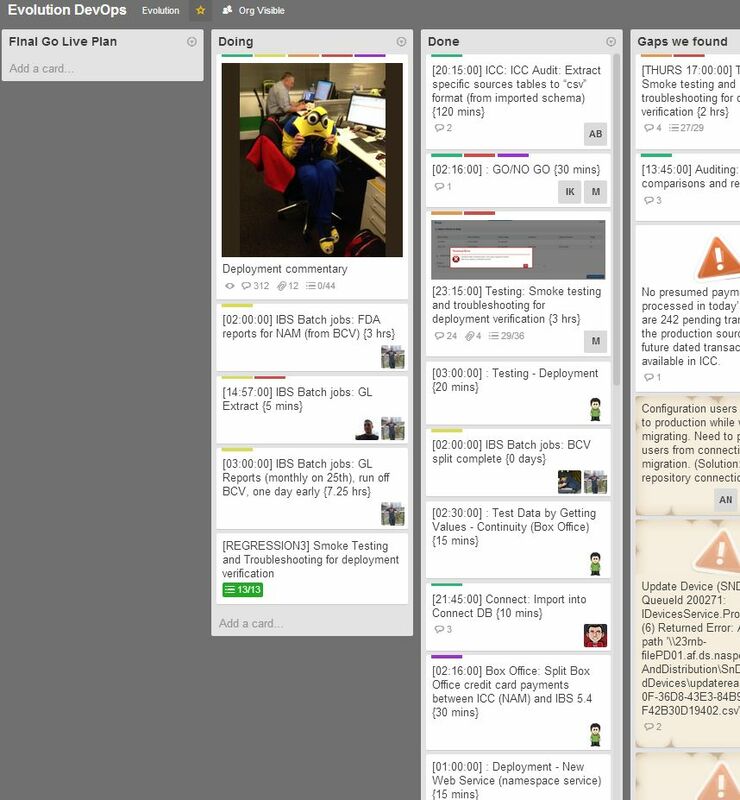 I’d been using Trello for some teams that we were coaching and was impressed with it’s slick online Kanban features. Concatenate the start time, description and task duration to come up with a better Trello task description (simple Excel formula). I also deleted leading spaces created by MS-Project’s indents. An excerpt is shown below. The “Trello name” is the generated name in the far right hand column. 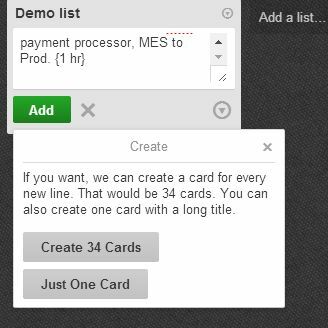 Once the previous steps were done (they only take a few minutes), the entire “Trello name” column can be copied and pasted into Trello (see screen grab below). Trello allows you to import up to a hundred tasks at a time. As we had over a hundred I had to do it twice. The entire process going from MS-Project to Trello took about 10 minutes in total with checking! The end result is a prepped deployment board that allowed everyone to see what they needed to do and when they were expected to do it without needing to understand the intricacies of the planning process. They can also see which tasks are in motion and which things have been completed (people move their tasks as they do on a traditional Scrum board). This allowed people to be ready when it was their time to deliver on something. 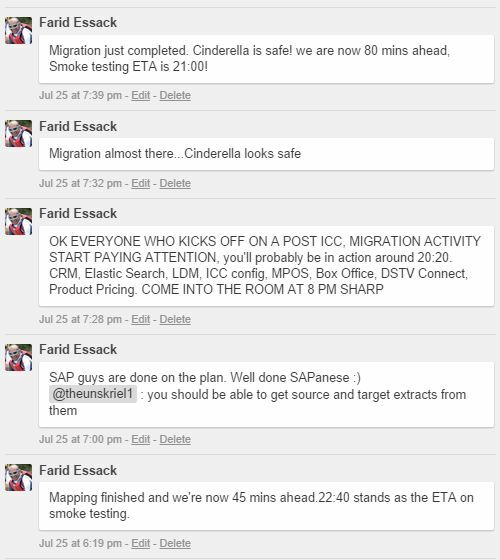 We aimed for a near-zero communication loss between parties and as Trello was a live view on the deployment, everyone was able to get themselves setup to act in advance of their ‘cue’! The picture below shows the board in the latter stage of the execution (no tasks left in ‘Planned’). Unfortunately I didn’t have a screen capture from earlier in the day when the originally imported plan was intact. Allow us to refactor the Gantt model based on empirical performance data (everyone captured the start and end times of their tasks during the dress rehearsals). This made the plan more accurate. We created a Trello task called “Deployment Commentary” which I used to keep all stakeholders informed as to where we were with the execution. As the coordinator of the deployment I was fully aware of the actual state (because I was monitoring the Trello board and orchestrating the actions) but in the background I was reconciling the critical path tasks against their planned start and end times on the Gantt chart. This meant that at any point in time I knew whether we were running ahead or behind of the planned execution and I knew the number of minutes. 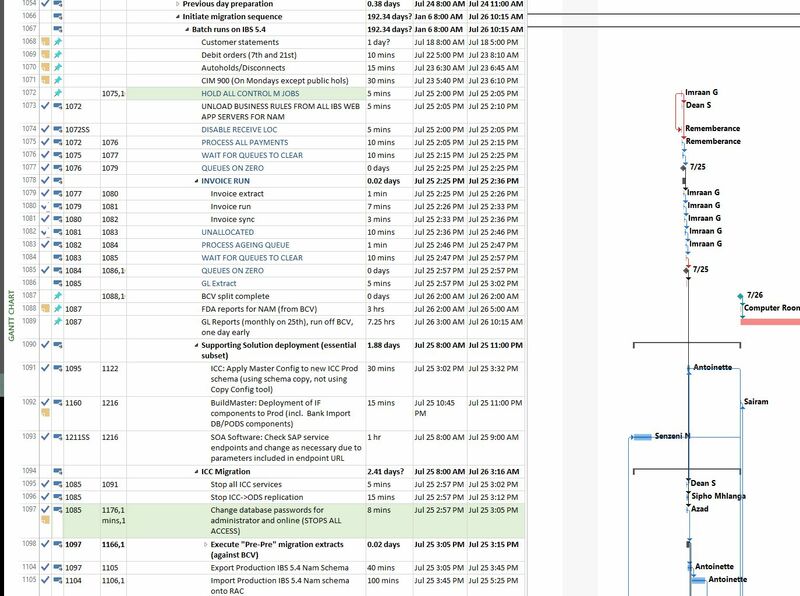 As each Critical path task was done, I checked the Gantt, worked out the delay and posted on the commentary so that EVERYONE knew what was going on from a single source. Most people had configured alerting on that task so they would get the update pushed directly to their smartphones or e-mail. It also limited the number of people coming into the Command Center to ask “where we’re at?”. This article tries to explain the differences in approach between predictive techniques in project management and agile/iterative techniques that use extrapolations of past performance measurements as a guide to future performance. I’ve tried to keep the explanation simple and used a very mechanical metaphor for a Scrum team’s operation! What is a predictive project? The full scope can accurately be described at the start of the project and captured in a detailed work breakdown structure (WBS). Work packages from the WBS may be elaborated into a definitive series of tasks each of which can accurately be estimated duration-wise. The results of the task definition and estimation processes may be collated in a schedule which also shows the dependency between the tasks. This is also known as big up-front planning, the result of which is typically a Gantt chart which is used to orchestrate the execution of the project. A Gantt chart looks like a series of waterfalls which why big up-front planning projects are referred to as ‘Waterfall’ executions. 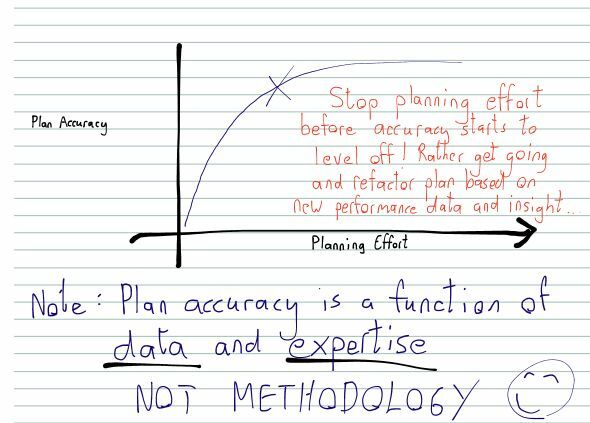 Good Waterfall projects can up to 90% accuracy but only when the scope is clear-cut and the execution risks are low (or the budget and execution timelines have been padded with adequate contingency allowances to counter the risks – ok but not an efficient approach economically). So what do you do when the scope is not known up-front or the activity durations cannot be estimated? The customer may not know how to proceed until they’ve seen a simple tangible solution. In other cases the predictability problem is exacerbated by an inability to estimate task durations with any real confidence. In the real world where we live and operate there are many contexts for which the definitive relationship between parameter x and parameter y is unknown i.e. it may exist as a formula but we don’t know it! At the same time we are able to get by, based on what we have learned over the years (empirical data= what we have learned through observation). We do this sort of thing regularly. Empirical predictions are derived from experiment and observation rather than theory. If there is no way of predicting the outcome of an initiative: run an experiment, gather lots of data frequently and use this data to predict future trends. To make more sense of a project running with performance data gathering and related control, I’ve tried to illustrate the workings of a Scrum Team using a mechanical process as a metaphor. 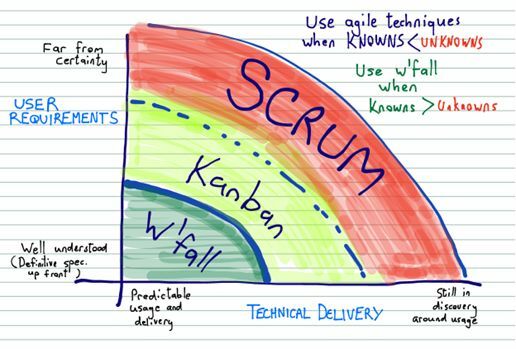 On the off chance that you don’t already know, Scrum is an agile delivery framework. 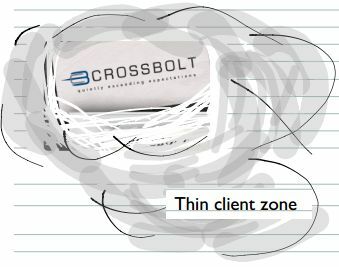 The sprint is shown as a big drum where selected user requirements are converted to completed functionality (demonstrable) through an imaginary fixed-duration combustion process (I couldn’t resist the pun on a ‘burndown’…snigger). 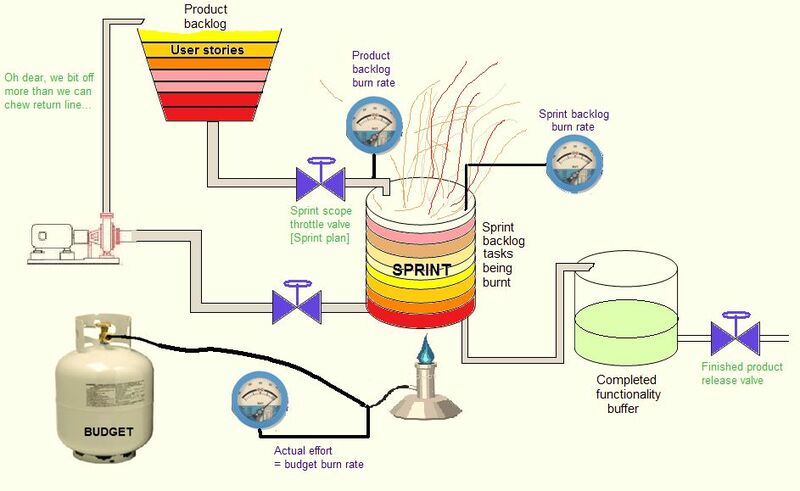 The Sprint scope throttle valve control how many user stories will be tackled in the Sprint. This is a control mechanism. We can track the rate at which the product backlog is being depleted by monitoring the product backlog burn rate. This is a measurement sensor. We can track the rate at which the Sprint backlog tasks are being burnt. This is a measurement sensor. If the sprint burn rate sensor suggests that the work of the Sprint will not be completed by the end of the allocated time, the return “oh dear, we bit of more than we can chew” return line allows for Sprint scope to be returned to the Product Backlog. This is a control mechanism. The actual effort is tracked measured sometimes even at a task granularity. 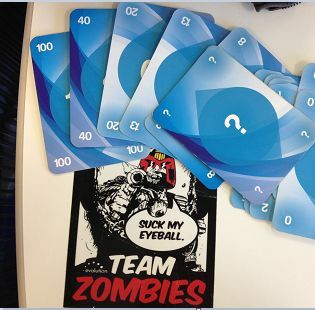 This allows the team to understand their sprint planning accuracy as well as give an indication of the budget burn rate. Note that single Scrum teams do not scale up very well* (you can’t add people easily and 7 is considered the ideal team size) so this is a measurement sensor (as opposed to a control mechanism). * I’ll handle the challenges of scaling Scrum in subsequent posts. Finally the “Completed functionality buffer” allows for completed functionality to be staged as product releases which may or may not be at the end of each Sprint. This together with the “Finished product release valve” is a control mechanism. 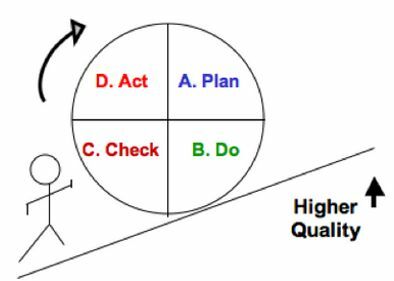 So to wrap up, when there is flux around requirements or the delivery platform/technology is new (or both) then up front planning cannot be done with a great deal of confidence. Under these circumstances, it would make more sense to use an agile delivery mechanism that runs the project as a controlled experiment. We put various sensors into this ‘experiment’ to capture performance data. This data helps us to predict the future performance of the project as well as to alert us quickly to any corrective actions that may be required (saving us from chaos). In the next post, I’ll explain how to predict the end of a flexible scope/agile project. My original motivation for the blog was to capture some of my real world learnings as an enabler for coaching activities. That way it’s easier to point people in this direction and say “just hear me out for now, don’t worry about trying to make notes – I’ll mail you a link to the article”. As its been a while since I posted, there’s been quite an accumulation of project management IP that can be packaged and put out here for critical consumption. I’ll give it a bash. It’s been a while since the last post and there’s been a lot going on (I’ll try and catch up over the course of a few posts). The other day, after seeing me tab through various browser windows at speed, our bookkeeper asked in jest if there was anything left in the company that wasn’t in the cloud. I had a good laugh and then went silent -to my amazement, I couldn’t think of anything! 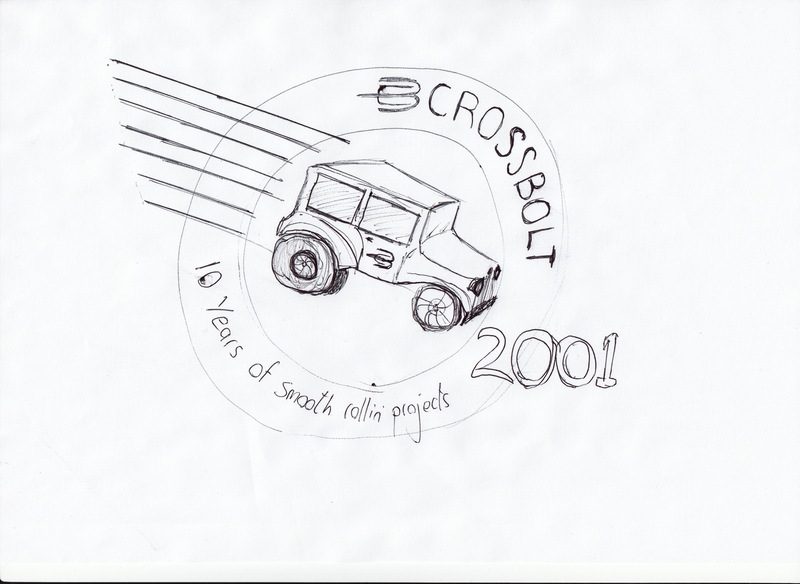 Let me backtrack a bit – Crossbolt has since its inception, pushed the technology boundaries on business automation. Examples include being paperless from the beginning, being truly location agnostic for several years (that’s hard), running WiFi and using mobile platforms since 2001 etc. Generally, if there was a more efficient way to tune the back-office function I was going to find it! Over the years as vendor SAAS models began to mature and bandwidth got cheaper and more reliable, I started moving pieces of the company’s application infrastructure ‘into the cloud’. The business case was simple: no more upgrades and back-ups to worry about and the freedom to work off any platform! Without further ado, here’s the list. It’s taken a while to settle on a system that worked and there were some failures along the way (it’s an evolution). File server: Dropbox is the bees knees, and we have a paid-for 50GB subscription for all company related data [$99/year]. This thing is invisible and does exactly what it promises, seamlessly making the data available across multiple devices and allowing easy access by several employees and contractors. This is much better than a LAN-based file server unless you are into huge media files (not a problem for us). Timesheets: We use Harvest for this [$12/user/mnth] and it turned a tedious spreadsheet-based, once a month catch-up into something that happens seamlessly through the day using an iPhone application. Allows for rapid scaling as contractors come onto projects and roll off again later. Accounting: We use Softline Pastel’s My Business Online product [R140/month for 2 user accounts]. 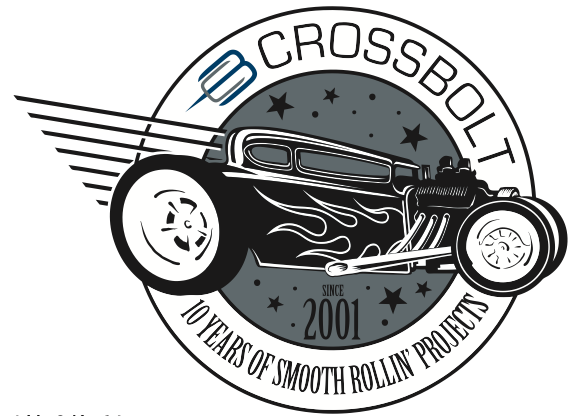 Crossbolt has been with Pastel since inception and the move to the cloud-based product happened this year and its brilliant! Finally the bookkeeper can do everything remotely and we all have access to the books and management reports without having to mail files around. This is major progress from having a client-based application on one PC at the office that everybody had to use. Payroll: We use Softline VIP’s Liquid Payroll, which demystifies everything related to payroll at R15/employee/month. This is well worth it unless you’re a masochist who enjoys dealing with managing somebody else who is also a bit confused trying to handle all the statutory rubbish that a business has to wade through to stay compliant (medical aid credits, fringe benefits, contributions, deductions, EMP 201’s, 501’s IRP 5’s blah blah blah). Bitchin’! Statutory taxation: SARS e-filing [free, other than the tax you have to pay…], which though clunky compared to some of the other products here, is light years ahead of the place from whence we came…and most of the rest of the world. Marketing: LinkedIn and WordPress and Facebook to an extent too. I also use Twitter and Google Alerts occasionally for market research (particularly around investments). You already know about these. Project Management: We use Scrumy for online Scrum boards to manage work internally and between geographically separated collaborators (we use graphic designers in Durban, Toronto and a printer in Cape Town as an example). Banking and Investment: Nedbank Online Banking and Standard Bank Online Share Trading. The latter is brilliant (there were two predecessors), the former doesn’t warrant a link! VoIP: Skype kills everything dead. We’ve been using for intercontinental comms since 2003. While many of these applications are household names, getting all the way there has taken some doing – particularly the accounting and payroll applications. 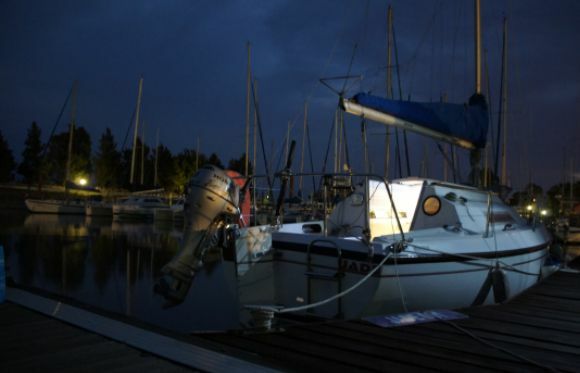 And the downside: well, without an internet connection, I might as well go sailing! Fortunately in the interests of uptime, we have several net connection mechanisms (ADSL, Vodacom 3G, Cell C broadband) and in fact can continue to run the business from the yacht. Like right now. Corneille & Leon recently returned from the USA after performing @ the 2011 Lee Ritenour Six String Theory International Guitar Competition World Finals. They rubbed shoulders with the likes of masters like Steve Lukather, Lee Ritenour, Scott Tennant, Joe Bonamassa and Doug Smith to name a few. Corneille & Leon won the World Classical / Flamenco category. 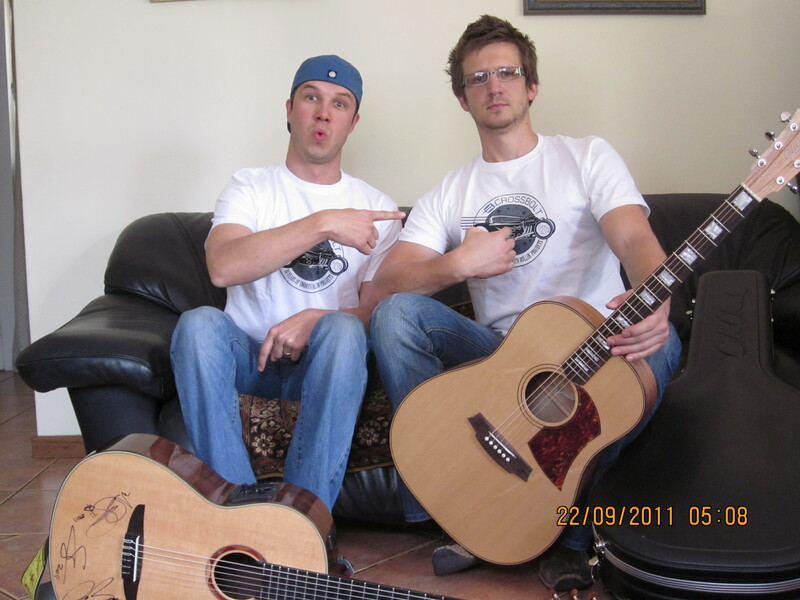 They recorded their first DVD with a full symphony orchestra in September 2011. CH2 get fantastic corporate exposure due to their (remarkably afrocentric) upbeat classical/jazz vibe. Good for them and great for us. 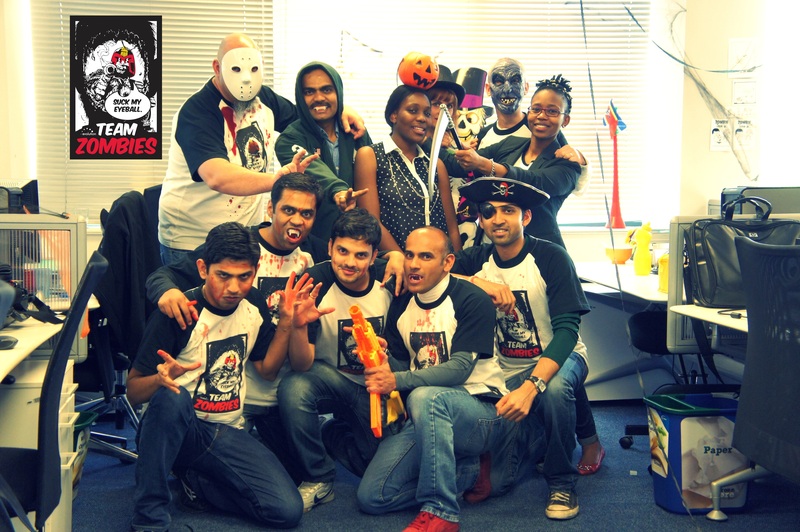 Watch this space, they’re hardworking, immensely talented and have a growing cult following.